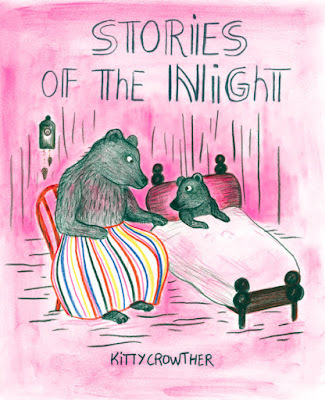 Winner of the Astrid Lindgren Memorial Award, Kitty Crowther has written and illustrated over forty books. This is her first title that has found me. Translated into English from Swedish by Julia Marshall, it is interpreted by Sam McCullen. What a delight it is! Three bedtime stories fill the contents. Created with make-up, the stunning electric pink colour used on the cover appears throughout the book. Being the colour of universal love, it accents the feminine, and the tender emotions evident between mother and child. Very much in the fairytale style of telling and illustration, it’s about Little Bear’s request for three stories. She says please three times to her mother so she gets her wish. The stories she hears are ones that have been told to her before, but each retelling is like hearing them for the first time. The first story is about the Night Guardian that puts all living things to sleep each night with her gong. But who puts the Night Guardian to sleep? In the second we hear about Zhora, a little girl pirate with a sword who goes in search of blackberries and gets lost. Luckily she meets up with the bat Jacko Mollo and finds a peaceful place to rest for the night. With the third tale, Little Bear is told is about a man named Bo that wears a big coat and never sleeps. Bo goes in search of his friend Otto the otter and finds a solution to his sleep problem. This is an ideal book for preparing children for sleep, with its tender references and delicate synthesis of text and illustration.